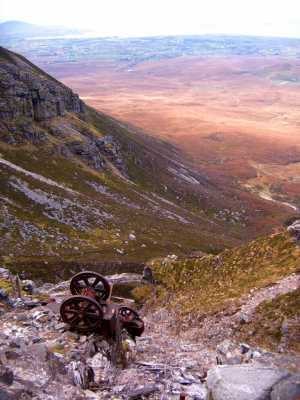 Muckish can be tackled by two main routes, by the Miner's track ( YouTube http://youtu.be/v51Wo2a8l0w ) or from Muckish Gap. For the Miner's track, turn left off the N56 about 2km north of Creeslough. Park about 8km along this little road, in a little grassy quarry on the left, just before the road loses its surface at about B998 293 A. Follow the track to its end and up the clear path into the corrie, up the precipitous backwall, taking care not to take any of the wrong paths (marked by low walls across them), until you reach the large flat area that has been quarried out of the mountain for its silica-rich rocks. 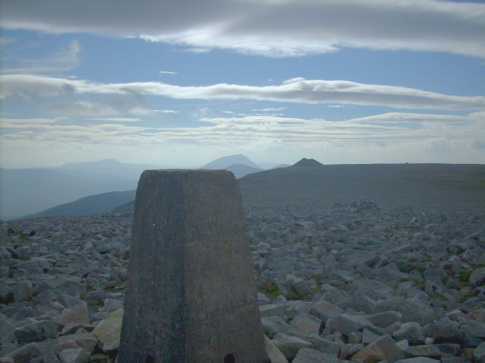 After pausing to admire the various bits of rusting machinery, and ponder how they got them up there, head up the path to the left and onto the stony expanse of the summit, from where the summit trig and nearby cross are a short stroll. 5 of us did a great climb of Muckish on Saturday. Using OSI Map 2, we had a choice of doing the easier Muckish Gap (starting around 993272 C) or the more difficult Miners Path. We chose the latter. Going north through Creeslough, about a mile or so later take a left turn at approx 051329 D, signposted Derryhariff - there is a graveyard on the right . Follow this road straight on, past a quarry workings on the right, over a cattle grid and keep straight on - the road winds up the mountain, it is tarmac most of the way, the last 200m or so is a bit rough and you'll come to a dead end just below the old quarry workings - there is room here for four or five cars parked on the side. As you face the mountain you'll see two large concrete slabs, one (on the left) with old machinery and the one on the right with nothing. On the one on the right someone has written in large red letters 'START' (now well worn) with an arrow pointing across the stream - this is the start! Along the way there are a number of these red arrows pointing the way. The first section is a scramble up to the wooden steps just below the start of the rockface proper - then it's a zigzag up to the top - if you come across a small wall of rocks blocking the path, this means 'don't go this way, you must have missed the main path'. The top is amazing - a large plateau with, as my sister commented, rocks which appear to have been rained down. Like the surface of the moon! 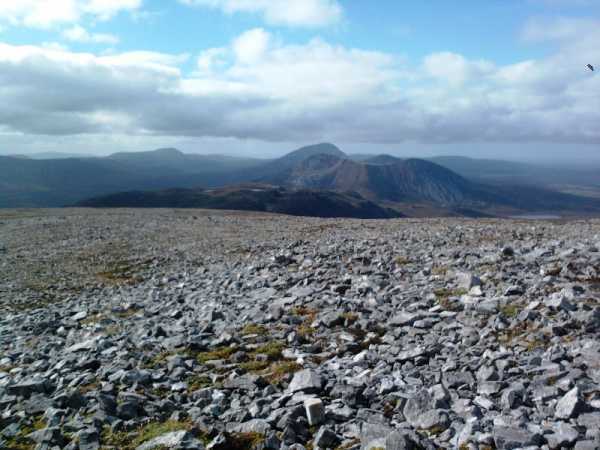 Amazing views all round, in particular Errigal looks splendid. There is a trig point, a huge cross made from girders (how did they get it up there? ), a prehistoric burial cairn (again our forefathers must have struggled to carry bodies up there in bare feet!! ), a small stone igloo and any number of cairns. 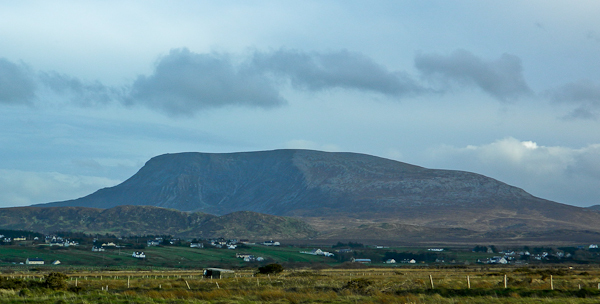 Walked up Muckish for only my second time yesterday, via the easy route which begins near the grotto. Conditions were clear and sunny for the most part. Made it across the lunar surface to the big cross. After a pick-me-up snack of Tesco BLT and some bits of Belgian choc washed down with 7UP, scrambled down part of the bouldery cross end, to check out if it's possible to scramble *up* without too much difficulty. My girlfriend and I tackled the Miner's Path today. It was steep, icy and snow-covered in parts and to be honest, we probably should have been wearing crampons. A somewhat nervous ascent for me, personally. She was very brave. Made the summit with every intention of NOT descending via the same route. Instead, motivated by the incoming mist & light snow, we quickly came off the plateau down part of the Muckish Gap path, threw a left and then took a somewhat tiring route round to the North face along the lower slopes of the hill, back to the waiting car. It took at least an hour-and-a-half, but, thank God, we were back in one piece. 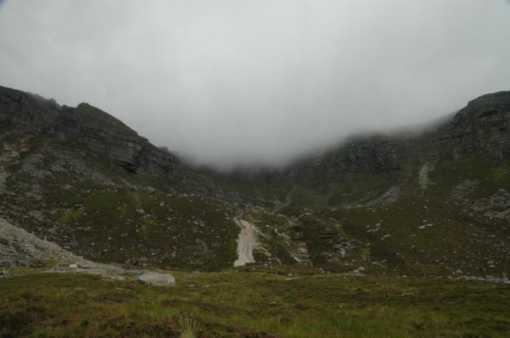 A descent by the Miner's - in today's conditions - would not have been a good idea. The Miner's Path is narrow and exposed in parts so, even in good conditions, it should be tackled with caution.